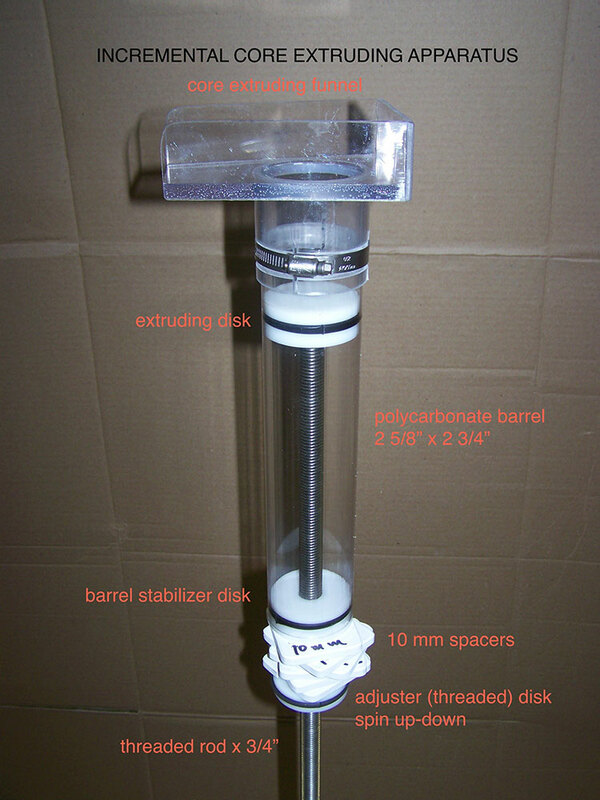 The Incremental Core Extruding Apparatus enables one to carefully extrude mud from the “bottom-up” in a standard Clear Polycarbonate Core Barrel: 2 5/8” ID X 2 ¾” OD X 1.2 m long (or shorter). The assembly comes pre-assembled for ease of use. A stable work platform is required for any coring operation. This method requires some time and effort to master, but produces good results. Below, please find some directions and photos on how the use the Extruder assembly. Footpad… Use wood screws x 2 ½” long to secure the footpad to plywood or floor. Screw on the Threaded Extruding Rod until it reaches the floor and tighten the ¾” nut/washer against the footpad. 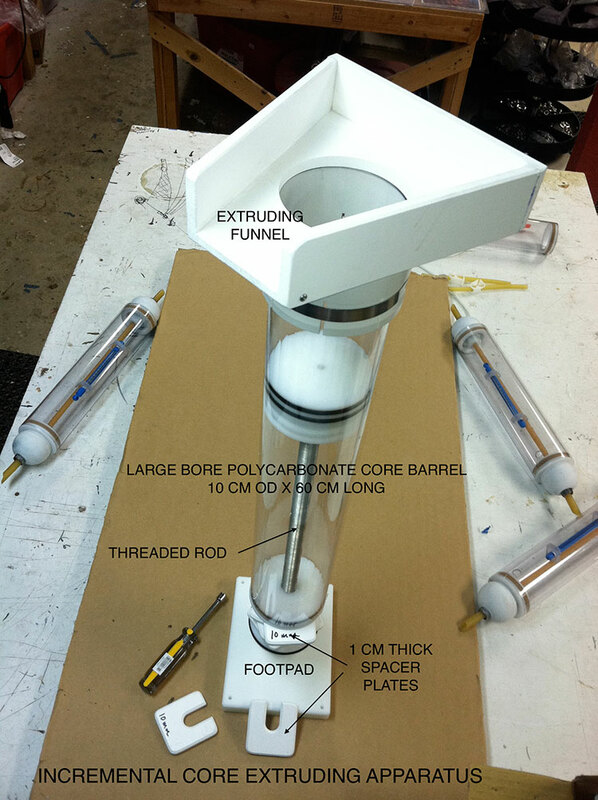 Barrel Funnel… Used to focus sediment sample into narrow path so it can be transferred into small sample container. Push the funnel down over the top of Core Barrel until it stops. Use a Hex Driver to tighten collar to Core Barrel. Extruding Plug…This part is inserted into the core barrel at time of collection. See “O” rings below. Extruding Disk… This is screwed to the top of the Extruding Rod and butts against the above Extruding plug during extruding process.. It may not be necessary to use “O” rings on this disk depending on the nature of the sediments. Core Barrel Stabilizer Disk…this part is used to stabilize the bottom of the core barrel during the extruding process. This disk freely glides up and down on the extruding rod. Lubricate the “O” ring and insert Disk into Barrel using a twisting/turning action to seat properly. Spacer Plates (10 mm thick)… These plates are used as gauges for extruding precise 10mm horizons from the Core Barrel. These Spacers are used in conjunction with the below Adjuster Disk. Adjuster Disk… This disk acts as a “stop” and allows one to extrude thicker layers without ‘over’ extruding. The disk is threaded so it can be spun up or down on the Extruding Rod. “O” Rings…Clear Polycarbonate Core Barrels have nominal variation of their inside diameter between production runs. This can sometime affect the fit of “O” rings. First, lubricate all “O” rings with clean water or dry silicone spray before use. It may not be necessary to use “O” rings at all depending on the nature of the sediments. You may be required to “tune in” an “O” ring fit by using commonly found Teflon tape. Increase tension of “O” ring by wrapping Extruding Plug groove with several wraps of tape. Reinsert “O” ring and test fit. If “O” rings become dislodged during extruding or squeezing; wrap the Teflon tape on outside of disk to keep the ring captive. Reinsert and test fit. Mount Core Barrel (with Core Extruding Plug in place) atop of the Extruding Disk. Pull Core Barrel downward approximately 10 cm and insert the Core Barrel Stabilizer Disk. Lubricate the “O” ring and use a twisting/pushing action to seat this disk and “O” ring properly. Pull Downward on the core barrel until the top of the sediment is even with top of barrel/funnel. Insert the Spacer Plates below the Core Barrel Stabilizer Disk and above the Adjuster Disk. Spin the Adjuster Disk upwards until it touches the set of Spaces. 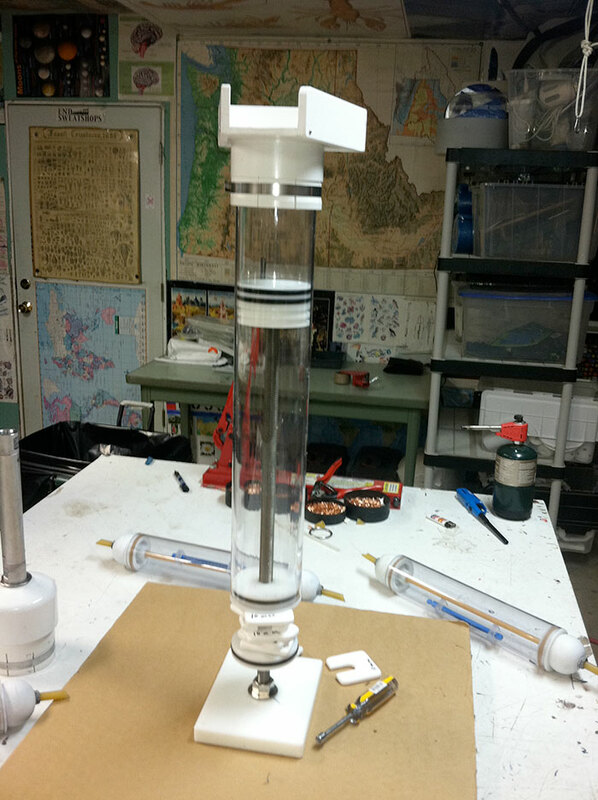 Remove Spacer Pate and pull Core Barrel downward to expel exactly 10 mm of sediments from the barrel. Scrap sample from funnel to sample container.